Published in 1994 by FWGS. A complete listing of burials from grave stones, the Oakwood Sexton's books and other various records. There are 111 pages of obituaries and biographical information, 10 pages of photographs. This book is printed on 688 pages of 8 1/2 x 11 acid free bond paper, has a surname index and a library buckram binding. 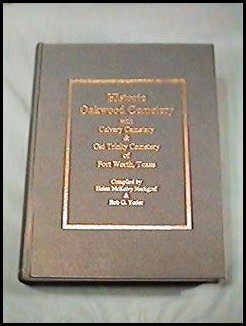 Oakwood, known for the first few years as "City Cemetery", is the second oldest cemetery in Fort Worth, and is the final resting place of cattle kings and cotton kings, of oil barons and business tycoons, of bankers and statesmen. There are writers, teachers and musicians, brave soldiers and beautiful women, the notable as well as notorious, famous gunslingers and pistol duelist. People from all walks of life sleep quietly here. The cemetery was designated as an official historical site in 1966 through the efforts of Mayor Willard BARR and members of the City Council; the marker was placed at a dedication ceremony on April 2, 1967. Since that time a beautiful ornamental gate and an iron fence along Grand Ave. has been erected with donations from interested lot holders sought by the Oakwood Cemetery Association. The Historical marker at Oakwood Cemetery reads, "Founded 1879 by John Peter SMITH who donated the first 20 acres, since enlarged to about 100 acres. Within the area are three separate cemeteries, known as Oakwood, Calvary and Trinity. Many Fort Worth and Tarrant County men of distinction lie buried here. Plots are owned by lodges, unions, Catholics, and Protestants, negroes and whites. Tracts are dedicated to both Confederate and Union Soldiers. The Chapel was built in 1912. Oakwood and Calvary Association provide care, with some assistance from the City of Fort Worth." A Part of the original tract was reserved for blacks and is called "Old Trinity Cemetery". There are people of color also buried in Oakwood. At the request of Bishop C.W. DUBOIS, of Galveston, a separate plot was partitioned off by John Peter SMITH for the Catholic Church on June 9, 1880. This part of the cemetery became known as "Calvary" and, like Oakwood, is still having burials today. White Settlement Cemetery with an estimated 350 graves was moved to Oakwood in 1952/53 to make room for the extension of the Carswell Air Force Base main runway. Many of these graves were unmarked and now have a number on the stone which corresponds with photographs taken before the cemetery was moved. If relatives can identify from pictures the spots where there ancestors were buried, they can be told by the Corp of Engineers where the new graves lie in Oakwood. This book consists of Oakwood, Calvary and Old Trinity Cemeteries. There are some biographical sketches and obituaries. Also included are letters from those persons who submitted information on their ancestors and loved ones. All of the letters we received have been used. Some of them were edited for lack of space and the original letter has been placed in the files at Oakwood Cemetery. The cemeteries are listed in three different sections of the book. Each one has been broken down into the bock numbers. The lot, space and row numbers, where applicable, are listed under the block number heading. This was done so that you may easily see who is buried near of with your family, and perhaps find some missing links in your family tree. This page last modified 8 March 2008. 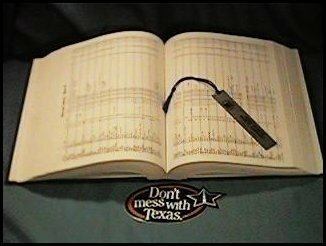 Copyright © 2006-2008, Fort Worth Genealogical Society. All rights reserved.